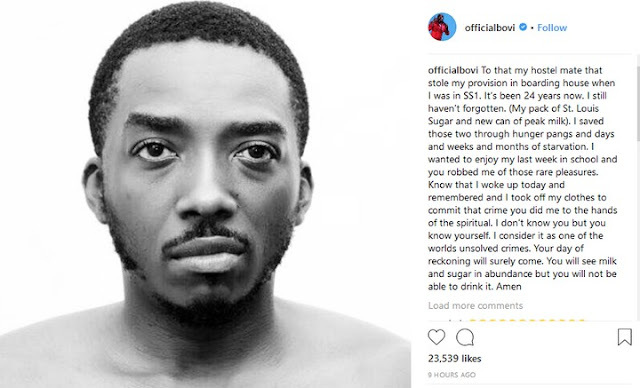 Popular Nigerian comedian Bovi has taken to his Instagram page to call out a thief whom he claimed stole his tin of milk and other provisions while in secondary school 24 years ago. In his narration, he explained how he had gone on hunger strike to save some the tin of milk and a box of sugar, for the last week in school, only for the items to be stolen by the unidentified thief. To that my hostel mate that stole my provision in boarding house when I was in SS1. It’s been 24 years now. I still haven’t forgotten. (My pack of St. Louis Sugar and new can of peak milk). I saved those two through hunger pangs and days and weeks and months of starvation. I wanted to enjoy my last week in school and you robbed me of those rare pleasures.